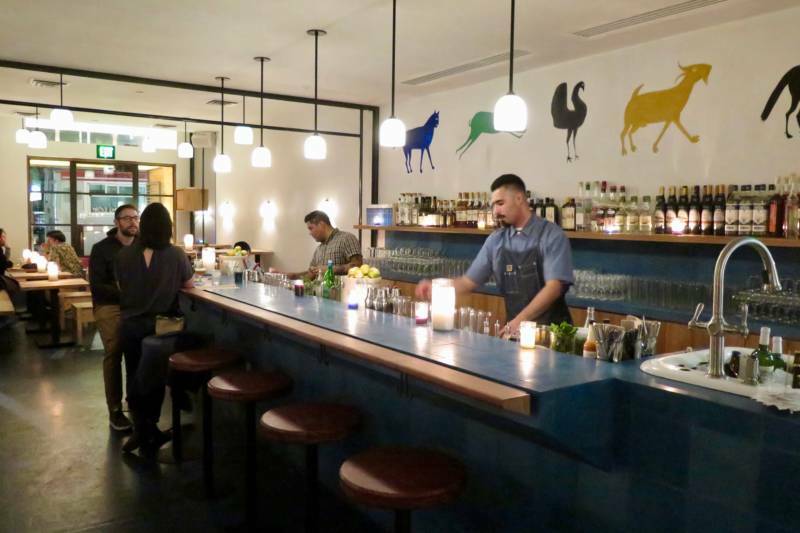 Plan a visit to Obispo on 24th Street for rum and savory dishes, warm up with bone marrow ramen at Ushi Taro, check out the new Pizzeria Delfina Downtown, and two pop-up events with roasted pig and a wagyu tasting menu. 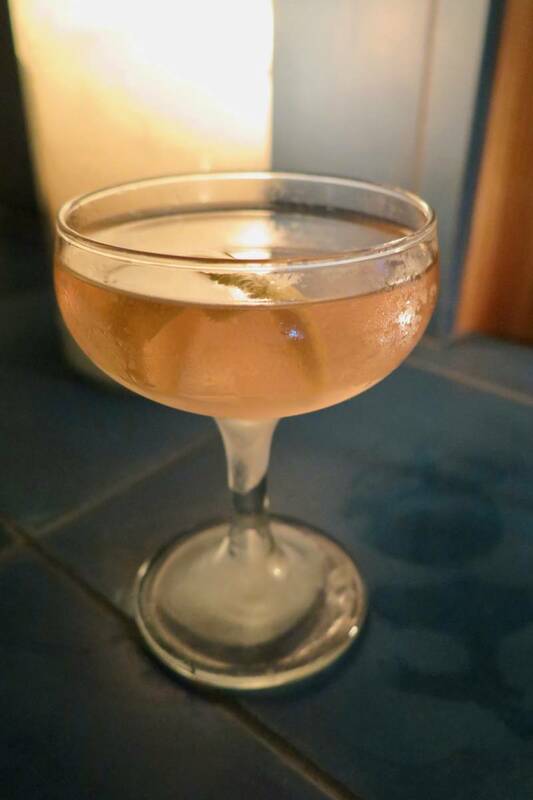 Now open in the Mission is Obispo, the latest project from Bar Agricole and Trou Normand’s Thad Vogler, who has created a very special homage to rum, its origins and challenging history, its craft, and many expressions. Vogler is known for his passion for terroir and the artisan, so don’t expect any umbrella drinks: if you want to really get to know rum, you’ll drink it neat here. The bar offering is highly edited and carefully curated. The cocktails include a trio of Mojitos, the dreamy El Presidente made with vermouth, the National with a welcome hit of pineapple, and the ‘Ti Punch features the funky kick of rhum agricole (which is distilled from fresh cane sugar). All the cocktails are priced at $14 and under (most are closer to $10) — Vogler wanted to ensure they were affordable for the neighborhood. Seth Stowaway has built a menu that highlights dishes from places and cultures where rum is produced, from Jamaican oxtail stew ($15/$28) to a hearty cubano ($15) to choripan ($12) in Argentina. The can’t-miss dish is the spicy, juicy, grilled pollo de Obispo ($18/$34 for a whole bird) — it has a wonderful smoky kiss. You can get it in a plate lunch that comes with two sides ($20), like the creamy maduros, macaroni salad (it has a high nostalgia factor), congrí (rice and beans), collards, and more. 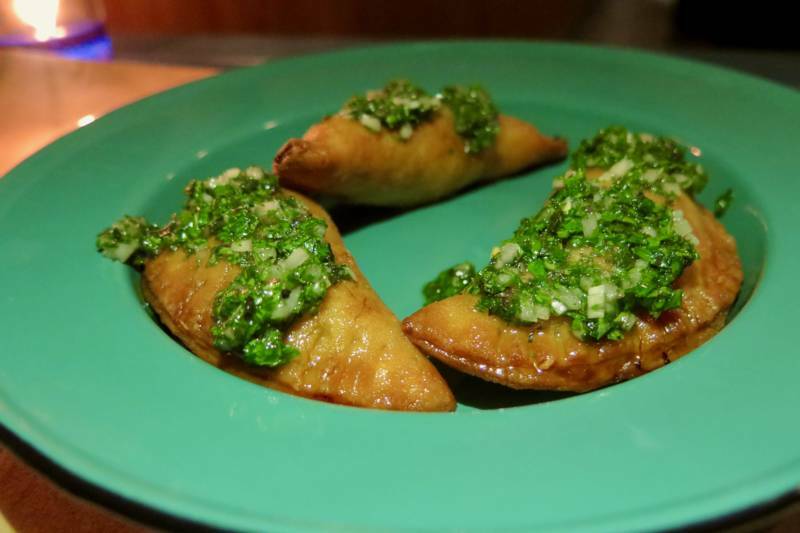 Or you can just nibble on some beef or potato empanadas ($4 each) with chimichurri. Obispo is unexpectedly spacious — there’s seating at tables in the front, the bar, and then there's a back room with even more tables and a look into the semi-open kitchen; Wylie Price designed the space. The handcrafted simplicity of all the wood tables and chairs pairs with the reproduced folk mural above the bar from artist Bill Traylor (who was born into slavery) — Vogler partnered with SF’s Museum of the African Diaspora for ongoing art installations, which can help remind and educate guests about rum's history (and roots in slavery and colonialism). He also worked with Calle 24 on being mindful of the needs of the neighborhood (keeping prices affordable, all the staff speaks Spanish, and the menu is in Spanish) to help preserve its character; both organizations will also receive some profits. There’s a wonderful atmosphere in the bar, from the Latin music to the soft candlelight to the smell of mint (and smoky chicken), the sound of cocktails being stirred, and a room full of industry folks coming by to check it out. You should too. 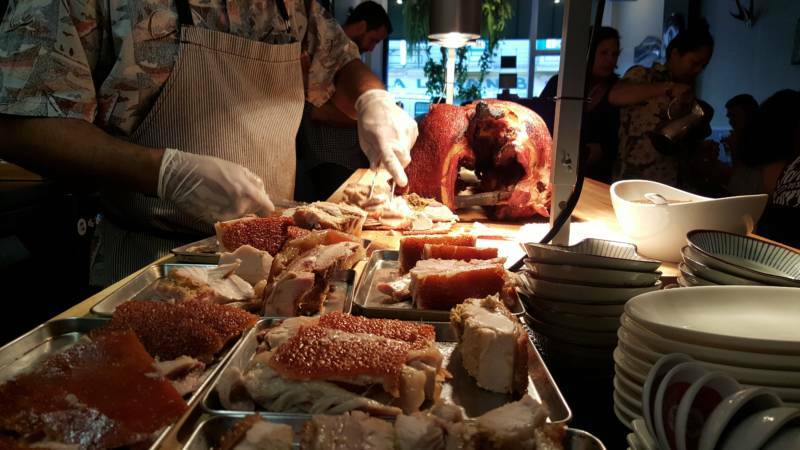 Anyone who has been missing the Chamorro cooking of Prubechu in the Mission (the former Guamanian restaurant from chef Shawn Naputi and general manager Shawn Camacho) won’t want to miss their pop-up at Harmonic Brewing. On Friday, January 18, they will be cooking a whole-roasted pig, and serving it with red rice and pickles. You can pre-order a plate for $12, or hope to get one on-premise for $14. Enjoy some of Harmonic's amazing brews, and it’s kid- and dog-friendly, so bring the whole fam! Fans of Pizzeria Delfina’s crispy crust pizzas and antipasti (like their chilled tripe!) 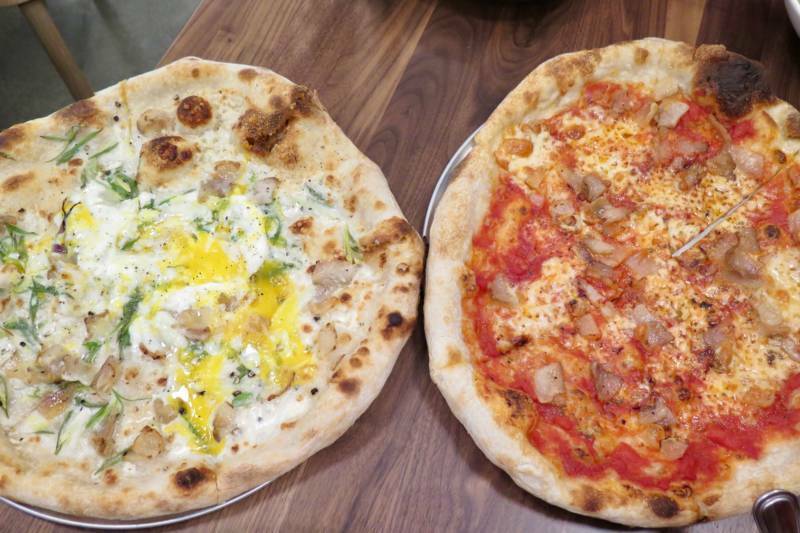 have a new location to visit for lunch or dinner: Pizzeria Delfina Downtown. The 46-seat space has a clean and airy look, complete with a fun SF mural by Shawn Bullen — there’s outdoor seating too. The pizzas are as good as ever — don’t miss the carbonara (with guanciale, egg, pecorino, scallions, black pepper) and if you want another pasta dish for your pizza, there’s their amatriciana (guanciale, chile, tomato, pecorino, black pepper) — both were $19 each. Some new things to note: there are a few pasta options from chef de cuisine Madison Montoto (similar to the expanded menu offered at the Pacific Heights location) that rotate weekly, plus some seasonal vegetable sides, and you’ll also find an expanded wine list from wine director Sally Kim of Italian and Californian selections, including two special wines for Pizzeria Delfina from Scribe (a chardonnay poured en magnum!) and De Conciliis. The other fun addition happening is their new soft-serve from Double 8 Dairy: fior di latte or chocolate or swirl (made with creamy buffalo milk) — you definitely want to save room for dessert. 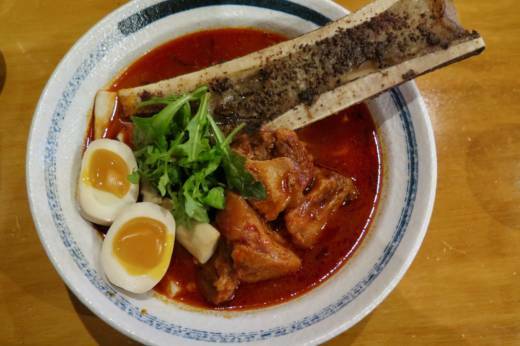 If you’re a lover of bone marrow, there’s a ramen shop in the Inner Sunset that is known for offering a bone marrow supplement to your bowl of noodles called Ushi Taro. 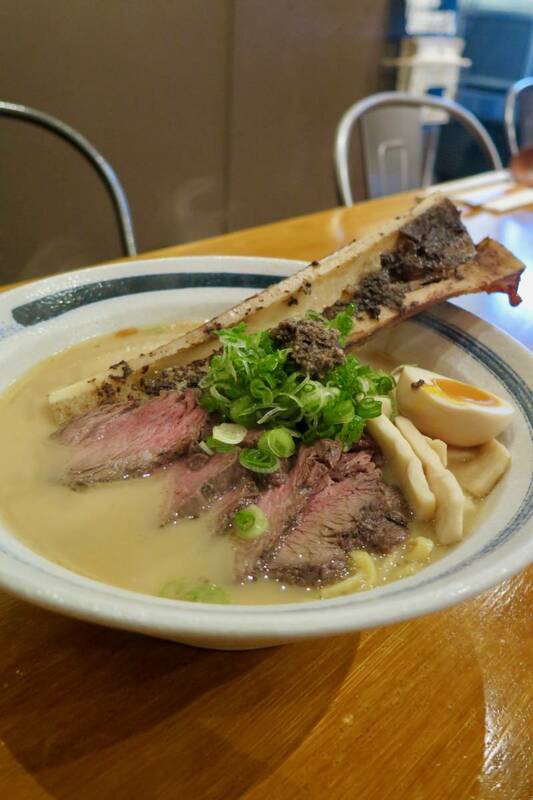 There are five kinds of broth (beef paitan or spicy, shio, vegan, or oxtail and tomato) and bowls that range from $12–$15, and while they call it ramen, I think ramen purists will be happier if they think of it as a tasty bowl of noodles, but not a pinnacle of ramen broth technique and noodle sourcing. The bone marrow supplement is $6, which gets hit with a swath of black truffle paste and is torched before being added on top of your bowl (you scoop it into your bowl for a big flavor boost, but be careful to not burn your fingers on the bone). Oxtail or beef tenderloin are other supplements, for $5 each. The bowls come with meaty oyster mushrooms, which are a great pairing with the beefy notes. Sadly the sliced onsen egg shows up cold in the bowl ($1.50 extra for some bowls), but at least the yolk was custardy and flavorful. Personally, I loved the heartiness of the oxtail and tomato, which is more of a Cantonese pairing than Japanese, and was perfect on a rainy night. 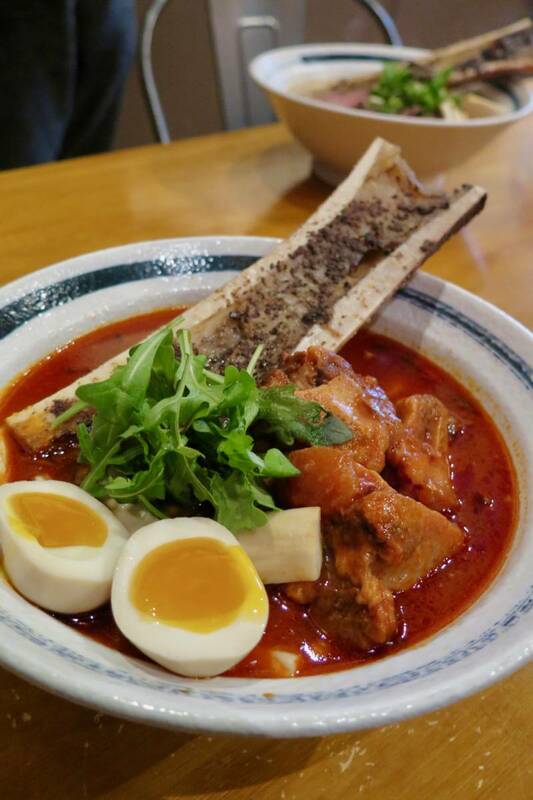 My friend enjoyed his beef paitan, with notes of kelp and bonito, but the oxtail and tomato was the unexpected winner for full flavor (and richness). Appetizers include juicy beef gyoza with spicy soy, a few tempura options (okra, mushroom), and other beefy options. There’s also an oxtail stew and tomato rice bowl option, and gyudon. There is no alcohol served nor is BYOB allowed, so your tab will stay reasonable. 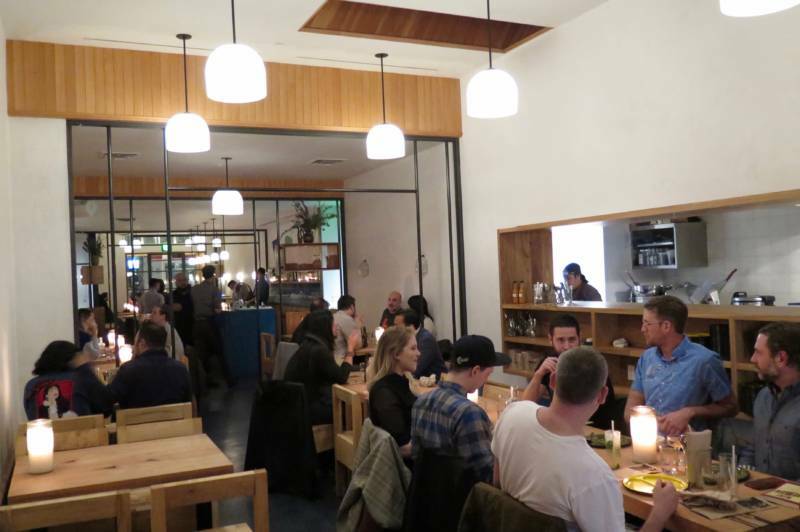 It’s a casual spot, with people coming in for a bowl at communal tables or the counters, and then heading out soon thereafter. $98 set menu with optional supplements and beverage pairings. Reserve on Tock. 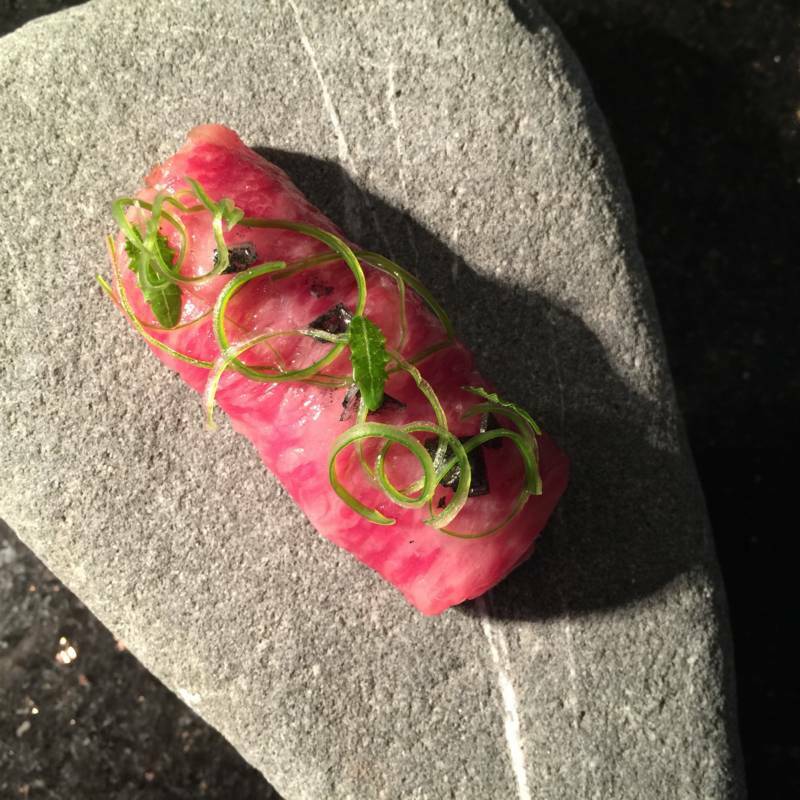 Chef Marc Zimmerman, previously of Alexander’s Steakhouse (and Nobu and Restaurant Guy Savoy), is opening Ittoryu Gozu in SoMa, a restaurant that will center on wagyu beef and robata-style cooking. But until that opens, you can check out his cooking in a collaborative dinner at Avery with chef-owner Rodney Wages (with four dishes from each chef). From January 23–25, they will be offering an eight-course menu for $98, highlighting rare cuts of beef, and traditional robata techniques with creative culinary touches. Dishes will include wagyu 'nduja; beef marrow chawanmushi; and grilled fish and snow beef fat; there will also be the option to add two supplements for a total of ten courses.